Join us for a fun weekend of climbing, camping and companionship among the high mountains, domes and crags of the southern Yosemite High Country! 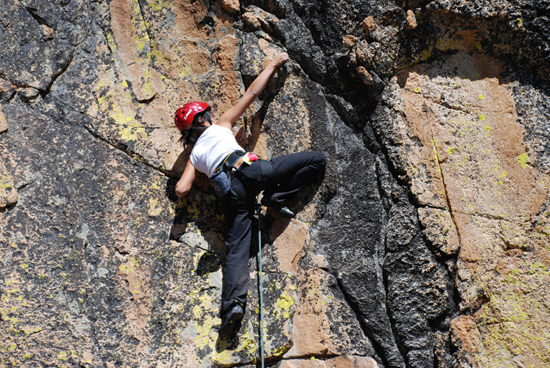 Whether you are a beginner or experienced climber, this trip offers something for everyone. With high guide-client ratios, you’ll spend plenty of time up on the rock, while receiving focused attention for improving your climbing technique & technical skills. We guide in the scenic southern Yosemite high country with access to more than 1,000 different climbs including Fresno Dome, Shuteye Ridge and The Balls areas. Sport, trad, top-roping or multi-pitch routes are all possibilities. Away from the hustle and bustle of Yosemite Valley, this spectacular area is perfect for teaching and creating intimate, personalized experiences. SYMG guides are professional, highly experienced, and hold certifications commiserate with the level of guiding they provide. And of course they are enjoyable people to be around! All have spent years perfecting their skills in and around Yosemite and look forward to not only teaching and guiding you in these spectacular locations, but getting to know you as well. Accommodations: Two nights tent camping at Bowler Campground in the scenic southern Yosemite high country. This quaint and rustic camp has basic amenities such as picnic tables, fireplaces and pit toilets. No shower facilities are available, though there are nearby creeks to wash up in at the end of the day. The site number will be posted at the campground entrance board. Equipment: We supply all group camping and climbing gear (ropes, protection, stoves, cookware, water filters, group first aid kit, etc.). We can also supply personal equipment (rock shoes, harness, helmet, sleeping bag, ground pad, and tent) upon request with no additional fee. You are welcome to bring your own personal camping and/or camping equipment if you prefer. A detailed gear list will be sent to you upon registration. Meals: We provide all meals and snacks from Dinner on Day 1 to Lunch and snacks on Day 3. Our "Backcountry Gourmet" meals have been acclaimed in Sunset Magazine. We take pride in providing excellent meals even in remote surroundings. Not Included: Transportation, personal gear (except as noted above), tips for guides (10-20% of trip cost is typical), and optional trip cancelation insurance. Preparation: No experience required. We cater to all levels of physical and technical proficiency. However, a basic rock climbing class in the rock gym, reading rock climbing instructional books and watching rock climbing videos will all enhance your experience and steepen your learning curve. An introductory session covering the fundamental principals of rock climbing, including belaying, knots, and climbing technique. Movement and climbing practice aimed at progressing your physical skills. Your guide will help you through increasingly harder climbs throughout the weekend. A customized, skills-focused day intended to answer any questions or solidify any skills you may have learned throughout the weekend. After a hearty breakfast prepared by your guide(s), we head to the rock for a morning of climbing. In addition to plenty of memorable time on the rock, you’ll receive personalized instruction from your guide(s) both on the ground and up on the wall. Around 5pm, we return to the campsite where dinner, campfire, and conversation end the day's activities. Our final day begins with breakfast and then it’s back to the rock. In addition to new climbs and perhaps even a new crag, we’ll continue with the instructional component of the trip based on your personal interests. We’ll finish the day between 2-3 pm. The weekend was awesome! Riley was excellent, the experience was educational and overall a blast. Thank you for a wonderful trip, looking forward to another SYMG experience! My twelve year old son and I just returned from a weekend rock climbing trip. Each conversation I had yesterday began with "Let me tell you about the great weekend I had". I can truly say I have never had a better family vacation than this weekend. Even my 12 year old son (who believed our rock climbing trip could not "top" Hawaii) said, "This is better than Hawaii!" Casey, our guide was patient, knowledgeable, supportive and encouraging. I appreciated his "exceptional ability" to connect with my son. By the end of the first day, Casey had become someone my son looked to for encouragement and support. Casey did this consistently and provided the appropriate limits a 12 year old boy need to hear (again and again). Casey is a great attribute to your staff. He truly went above the role of a guide and acted as a positive role model to my son. I appreciated his generosity of time and his willingness to do this. The activity of rock climbing was a "fit" for my son. He found the challenge rewarding and learned the virtue of persistence. Something every parent wants a young boy to learn. SYMG, thank you for making these opportunities available. Albert - I wanted to give a big thank you to SYMG and especially our guide Patrick. The boys and I had a great time. Most importantly they had fun, and I learned more about climbing and safety. Patrick is a pro (as I'm sure you all are), was patient with the kids, helped me and them learn and we were able to work through a good pace for the boys. He was a great cook too, I've already made his polenta, cheese, ham and basil breakfast several times (I added tomato). We also were in Tahoe last week and we climbed up at Donner Summit and I used both climbing techniques and top rope safety setups similar to the ones I learned. Thanks for the great trip and a fantastic experience for me and my son's making climbing come alive a bit more. Gosh I wish I'd started so young! Thanks again.